Booking open for the 2018-2019 school year. The KU Natural History Museum offers a variety of science education programs. Find program details by clicking on the grade buttons below, or download a brochure. School programs are available Tuesday through Friday during fall and spring terms. Bookings must be made at least three weeks in advance. Gallery Activities use select exhibits to investigate a particular topic. 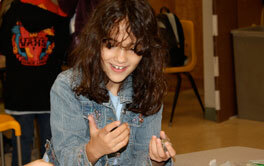 School Workshops are hands-on programs with activities that take place in the museum's education classroom. Select a grade for available programs, descriptions, fees and NGSS/Common Core standards information. A limited number of scholarships are available for school education programs. Typically, full scholarships are awarded to schools if 50 percent or more of students are eligible for a free/reduced lunch program. Programs offered through the education department are developed and taught by museum education professionals with science backgrounds and many years experience teaching in informal learning environments. Our School Programs FAQ provides information about school programs policies and procedures, and more. We’re proud of the programs we offer at the KU Natural History Museum. But don’t take our word for it! Check out reviews of our programs by teachers. Use our Discovery Guides and other Educator Resources to explore science with your students at the museum and in the classroom. Our School Programs Checklist will help you prepare for your visit. Our School Programs Chaperone Guide is a fillable PDF to share with chaperones that summarizes your program/visit schedule, parking information, museum map and policies.